Needles is located on Interstate 40 at the Colorado River. This puts you near the intersection of California, Arizona and Nevada. We spent a week here which included the New Year’s weekend. A little bit south of Needles on the Arizona side of the river is Lake Havasu and Lake Havasu City. We took a day trip there in large part to see the London Bridge. 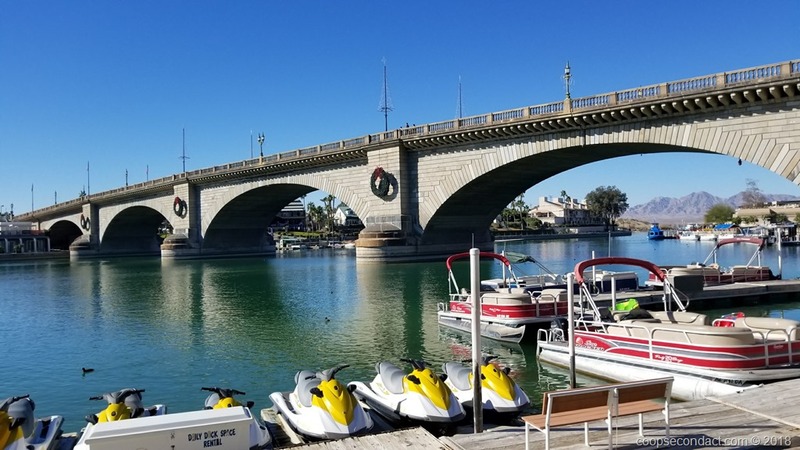 If you’re not familiar with the story, Lake Havasu City was established in the early 1960’s as a retirement community. At the time it was empty desert. An oilman, Robert McCulloch got the land at no cost from the state of Arizona with the condition that he must develop it. Not surprisingly, he had some difficulty attracting retirees. When the city of London, England, decided to sell the London Bridge, McCulloch became convinced that this was just the thing he needed to bring tourists and residents to his new community. They built a new concrete bridge structure and clad it in the original stonework which was numbered, removed and shipped to the US via Long Beach, CA. Today Lake Havasu City is a thriving community. Another day trip took us northeast into the Black Mountains of Mohave County, Arizona to the town of Oatman. In 1915, the town began a huge growth spurt when gold mining operations began in earnest. The Oatman stake had been claimed in the late 19th century but it took new technology and reduced transportation costs to bring large scale mining. The advent of World War II brought an end to most gold mining in the US since the country needed iron ore and lead for building ships and weapons. 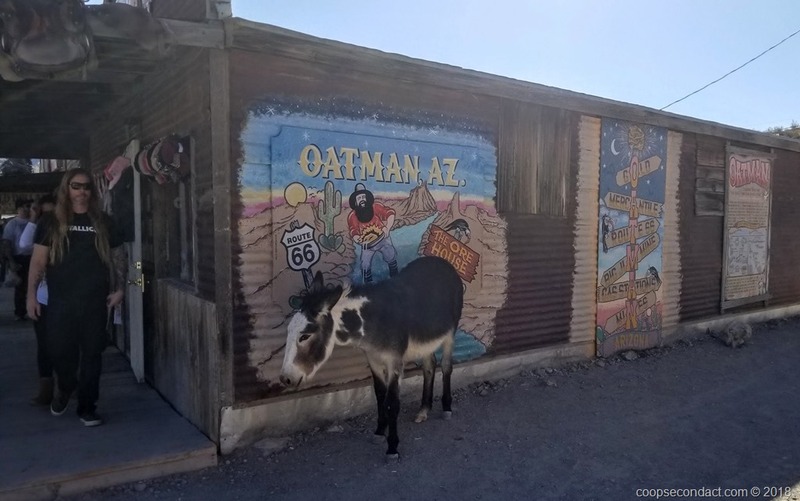 Since Oatman is located on the historic Route 66, the town enjoyed fairly strong tourism traffic, however, a new Interstate highway put a stop to that. In recent years, a renewed nostalgic interest in Route 66 along with tours from the nearby gambling town of Laughlin, NV, have brought back the tourists to the town which maintains its early 20th century look and feel. There are also wild burros that wander the streets waiting for the tourists to feed them “burro chow”, a hay biscuit which can be purchased everywhere. In turn the burros leave their own biscuits on the street.